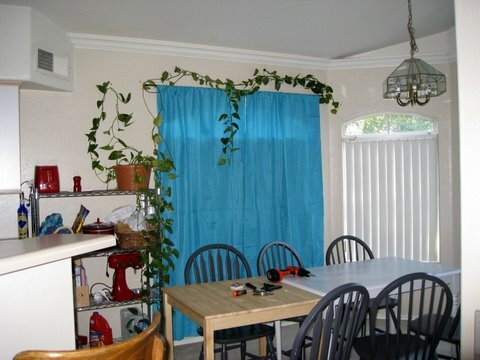 A year after living in this apartment I finally put up curtains in the dining room, restringing the vines as well. 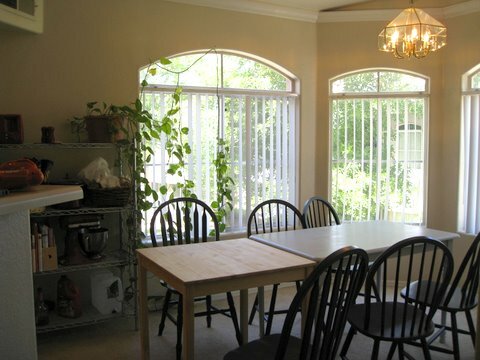 Sun pours through the west window every afternoon in the summer, heating the room and adding to the electric bill and sweat quotient. (On a related note, my new motto is “Shirts are for suckers”.) 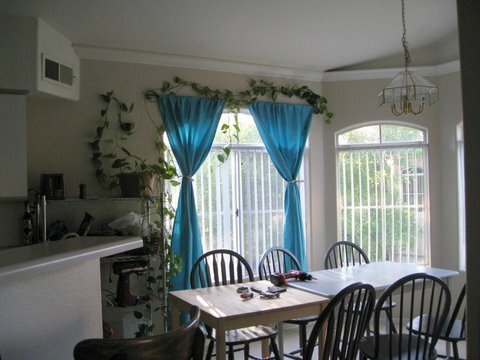 I bought “thermal curtains”, which appear to be regular drapery lined with a thick plastic-y substance for blocking out light, sun, and heat. And maybe cold, too, but that’s not much of an issue here. They read as blue in the pictures and they’re actually a turquoise aqua color, much greener than showing here. It took me an entire episode of “Grey’s Anatomy” to get these up. Measuring might have been a good idea. Instead I ended up with a constellation of holes near each bracket’s final location and a more-or-less straight curtain rod. June 8, 2011. Tags: before & after, completed project. Pictures, Projects, Words. June 8, 2011 at 10:20 am. Permalink. January 5, 2012 at 10:19 pm. Permalink.